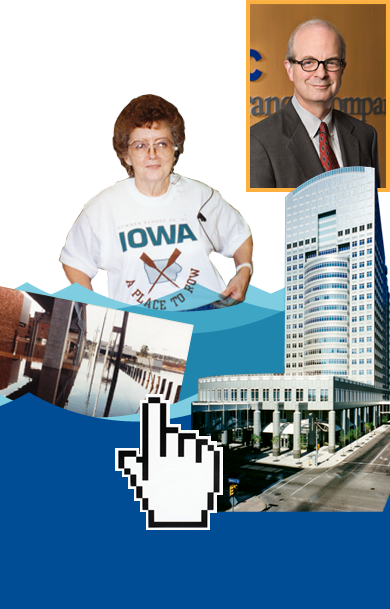 EMC began as an association of business people providing workers’ compensation coverage to Iowa manufacturers. Today, EMC ranks among the top 60 insurance organizations in the United States, selling its products solely through independent insurance agencies in more than 40 states. 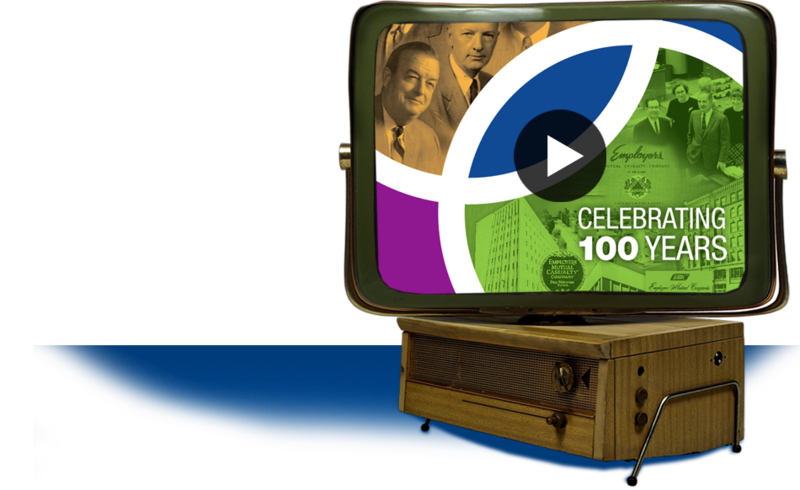 With those dedicated agents and our more than 2,100 employees, we are celebrating this significant milestone—a century of providing superior personalized service, stability and strength. Dedication. Entrepeneurial drive. Pioneering spirit. On April 21, the Iowa Manufacturers Association (IMA) voted to incorporate Employers Mutual Casualty Association of Iowa (EMCA) in anticipation of an Iowa workers’ compensation law, which passed in 1913. The IMA thought it would be better to insure Iowa companies in Iowa, and that it would cost less to establish their own mutual company to insure their members. On April 28, EMCA was certified as a legal entity "for the purpose of mutual insurance." The company’s first location was in the Crocker Building on Fifth and Locust Streets, Des Moines, IA. John A. Gunn was elected as the first president of EMCA. EMCA advertised nine types of liability coverage: Manufacturers’ Employers; Contractors’ Employers; Public, Vehicle or Teams; Automobile; Elevator; General; Owners’ and Contractors’ Protective and Contingent. First employee, Mattie P. “Peg” Burroughs, was hired to answer the phone. She ended up staying with the company for 30 years and by that time, she was the superintendent of the Automobile Policy Writing Department. Commitment to safety. Communication with agents. A new name. And World War I ends. EMC entered the automobile liability business with auto coverage for commercial fleets driven by policyholders’ traveling employees. 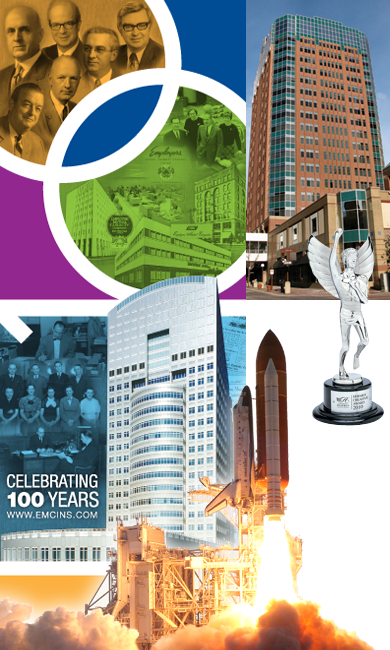 EMC printed The Employer, a newsletter for Iowa employers that promoted the company and mutual insurers in general. The cover story in the first issue—"Who Is Your Friend? "—introduced EMC as a friend who looks out for employers’ interests. Thirteen accident prevention tips were included in the issue, such as including guardrails on stairs, using machinery safety guards and goggles, installing proper lighting and "danger" signs, designating fire exits, keeping explosives off of the premises, and not retaining careless employees. 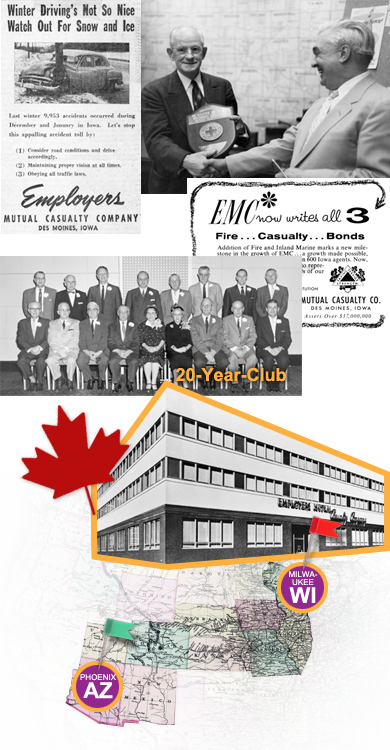 EMCA officially changed the company name to Employers Mutual Casualty Company at the Annual Meeting on Jan. 9. 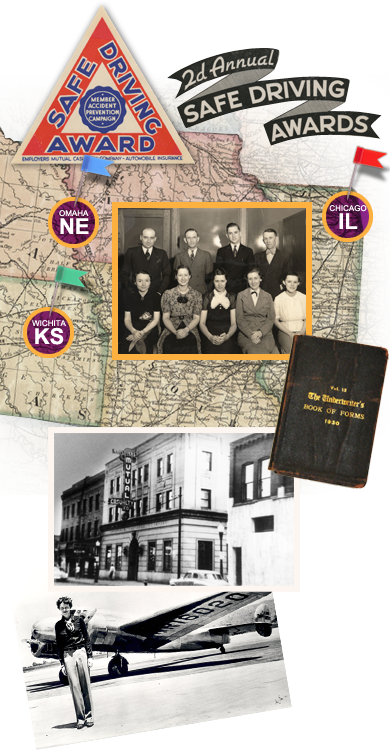 EMC ventured into Nebraska, Kansas and Missouri before the end of the decade. A safety engineer was hired in the Accident Prevention Department to act as “the eyes and ears of the Underwriting Department.” The engineer’s job was to inspect and report on newly insured policyholders and to provide recommendations and safety training for their foremen and supervisors. H.W. Jensen, an agent from Audubon, Iowa, won $10 in the name-the-newsletter contest for submitting The Co-Operator, a name that emphasized two-way communication between EMC and its agents—and the name is still used today. Growing assets. Midwest expansion. And Amelia Earhart is the first woman to fly solo across the Atlantic. EMC opened its first branch office in Wichita, Kansas. Auto safety was promoted through EMC’s “Safe Driving Program,” which awarded hundreds of thousands of windshield stickers to drivers with two-year safe driving records. Agents were encouraged to organize safety committees and promote safe driving in their communities. The Chicago Branch Office opened to handle the growing Illinois business. The company purchased the Brinsmaid Building at 204-207 Seventh St. in Des Moines. The building was formerly a china shop. Emphasis on accident prevention and education. Changing company leadership. And World War II ends. The Lansing Branch Office opened. John W. Gunn was named president upon the resignation of his father, John A. Gunn, on Dec. 11. John W. Gunn returned as president/treasurer from 1957-1963. Oscar M. Nanfeldt was hired as EMC’s first chief safety engineer to head the new Accident Prevention Department and oversee EMC’s safety programs. He said four criteria were crucial to successful accident prevention: management’s interest and education, the education of supervisors and employees, prevention through engineering, and the ongoing enforcement of the program. The first annual Conference and School for home office and branch professional employees was held in Des Moines. Company leaders and occasional outside speakers presented topics covering the wide range of company operations and current developments affecting the industry. The Conference and School continued until 1970. The Minneapolis Branch Office opened. To support the war effort, EMC held more than $4 million in government bonds. The Philadelphia Branch Office opened, which became the current Valley Forge Service Office. John F. Hynes was named president when John W. Gunn retired. Moving into insurance for homes and personal autos. And moving into a new home office. EMC began giving awards to large client companies with outstanding safety programs and records. First to receive the award was Lennox Furnace Company of Marshalltown, Iowa. Other recipients were the Des Moines Register and Tribune; a manufacturing company and an iron works, both in St. Louis; a transportation company in Racine, Wis.; and a workshop for the blind in Charlotte, N.C.
EMC went international when its British Columbia, Canada Branch opened. By 1967, EMC was the second largest writer of auto premiums in British Columbia. Two years later, Canada passed a no-fault auto insurance plan, and EMC pulled out. EMC entered the property insurance business, offering fire, burglary, personal liability, personal property and more. One year later, this coverage was available in 21 states. Early policies included a home protector package (fire, burglary, personal liability, personal property and more) and a standard homeowner’s policy. A new family auto policy for private passenger cars was offered by EMC. EMC employees moved into a new home office and Iowa Branch building. The Milwaukee Branch Office opened. A 20-Year-Club was formed with 18 charter employee members who had worked at least 20 years at EMC. The Phoenix Branch Office opened. A life company. New branch offices. Computer technology. And man lands on the moon. 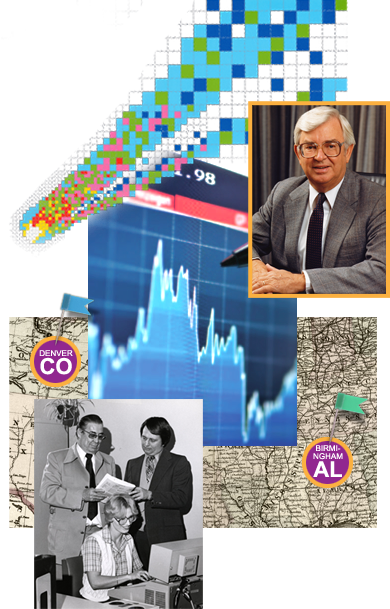 On Jan. 15, Robb Kelley (named EMC president in 1963) wrote a note to himself: "Things to do today—develop a life company," to make EMC a one-stop facility for offering a complete insurance package: property, casualty and life. Employers Modern Life was incorporated in August 1962 and was licensed to do business early in 1963. The company is now known as EMC National Life. On April 24, EMC employees celebrated the company’s 50th anniversary simultaneously in 24 cities with coffee, cake and early 20th century costumes. The Kansas City Branch Office opened. EMC installed an IBM 1401 computer processing unit, card punch, printer and memory core—reported to have "speeds that stagger the imagination!" (EMC installed first mainframe computer, an IBM 650, in 1957.) The company continues to be recognized for its technology advancements. On March 13, Robb Kelley was named president of EMC. The Jackson Branch Office opened. The Providence Branch Office was created by an affiliation with Union Mutual Insurance Company of Providence, which was founded in 1863. EMC was licensed to do business in all 50 states. Building a new home office. Expanding loss control services. 60th anniversary celebrated with opening of new 10-story office building at 717 Mulberry St., Des Moines, IA. Loss control services expanded to include noise monitoring, safety videos and an environmental health lab. The Bismarck Branch Office opened when EMC acquired Dakota Fire Insurance Company. New motorcycle policies announced with a motorcycle display in the Home Office lobby. This coverage soon expanded to include other recreational vehicles such as snowmobiles and mopeds. The Charlotte Branch Office opened. EMC Underwriters Ltd incorporated to place unusual business, such as event cancellation or no-shows, sporting event or fair rainouts, Fourth of July celebrations and pumpkin festivals. EMC Underwriters Ltd wrote seven policies to cover parts of Pope John Paul II’s visit to Des Moines in October 1979. New companies. A new president. And 75 years as a company marked by Halley’s Comet. Two new companies were incorporated: EMC Reinsurance Company for reinsurance business and EMC Risk Services, Inc. to handle third-party administration. The Denver Branch Office opened. George Kochheiser was named president of EMC. EMC Insurance Group Inc. launched its initial stock offering. A 1985 sale of EMCI stock raised $20 million. In 2007, EMCI celebrated its 25th anniversary of being traded on NASDAQ with EMCI President George Kochheiser ringing the NASDAQ opening bell. The Birmingham Branch Office started with the purchase of American Liberty Insurance Company of Birmingham. Assets reached more than $500 million. EMC celebrated its 75th anniversary, marking the appearance of Halley’s Comet. The comet last appeared when the company began in 1911. The next time Halley’s Comet appears, EMC will be 150 years old. See photos from EMC branch office celebrations across the country celebrating 75 years. Employers Mutual Charitable Foundation (now the EMC Insurance Foundation) was established to provide a consistent level of giving. A 19-story building opens. EMC executives enter Insurance Hall of Fame. Bruce Gunn Kelley became president and COO, and was named CEO in 1992. His great grandfather, John A. Gunn, was the first president of the company. EMCC adopted "EMC Insurance Companies" as its trade name. July 11, Des Moines is flooded and without potable water for 3 weeks, but EMC stays open for business. The Special Investigations Unit formed to detect, deter, investigate and prosecute insurance fraud. EMC’s 19-story Home Office building opened at 700 Walnut in Des Moines, Iowa. The Cincinnati Branch Office opened with the conversion of Hamilton Mutual policies. 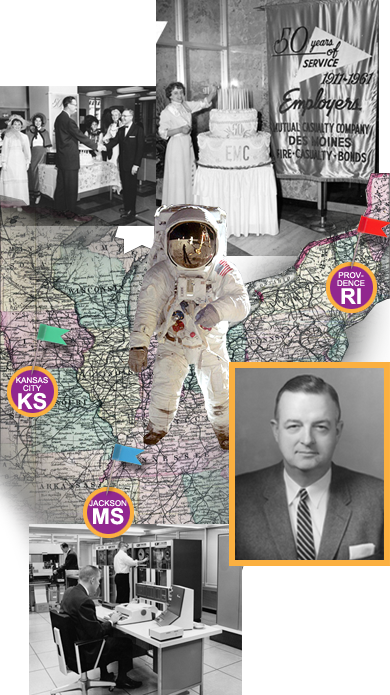 Robb B. Kelley is the first EMC executive inducted into the Iowa Insurance Hall of Fame. Other EMC executives have also been inducted into the Hall of Fame, read more. EMC’s first website was launched to help agents do business with EMC. Business built on a promise—Count on EMC®. The Count on EMC® brand was introduced, representing the core values upon which EMC Insurance Companies has built its reputation: comprehensive protection, superior service and financial stability. 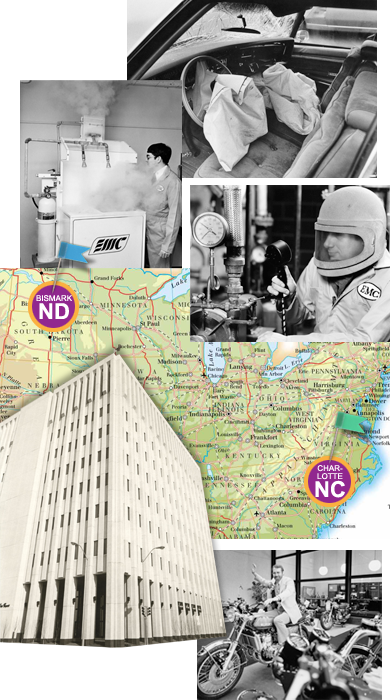 EMC National Life Company was formed by the merger of Employers Modern Life and National Travelers Life. Introduced EMC Choice® products for business owners and tailored coverages for specific industries. By 2006, commercial insureds (including government entities such as cities and schools) accounted for more than 85 percent of the company’s business. Continued improvements to the EMC website make it easier for customers and agents to do business online. Agents can quote business, submit applications, find policy, claims and billing information, and more on www.emcins.com. On Feb. 9, in honor of the 25th anniversary of EMCI’s initial stock offering, former President George Kochheiser rang the NASDAQ opening bell. 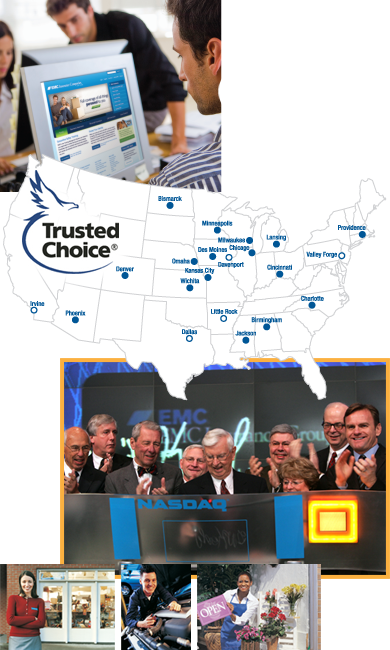 EMC joined Trusted Choice® brand initiative that highlights the benefits independent agencies and brokerage firms offer consumers: choice of companies, customization of policies and advocacy support. A new EMC website is introduced. A trusted company. Celebrating a century of success! And the 39th and final launch of Space Shuttle Discovery. EMC Insurance Group Inc. was named to Forbes 100 Most Trustworthy Companies list. EMC purchased the Hub Tower at 7th and Walnut in downtown Des Moines. Six technology awards were given to EMC in 2010. EMC celebrates 100 years in business.